John Muir's true story of what happened on an Alaskan glacier with a dog named Stickeen, in 1880, is one of Muir's best-known writings, and is now considered a classic dog story. Although it can be read as a straight adventure story, it is much more than that. Muir's story is most compelling because it revealed to Muir that man and dog were not so unlike each other. 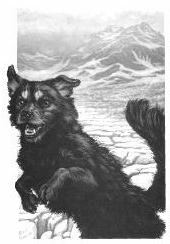 Stickeen was at first an unfriendly little dog, but after surviving a perilous journey across a glacier by crossing an ice bridge, Stickeen's aloofness is replaced by rapturous emotion, revealing to Muir the fact that our "horizontal brothers" are not that much unlike us. Muir wrote, "I have known many dogs, and many a story I could tell of their wisdom and devotion; but to none do I owe so much as to Stickeen. At first the least promising and least known of my dog-friends, he suddenly became the best known of them all. Our storm-battle for life brought him to light, and through him as through a window I have ever since been looking with deeper sympathy into all my fellow mortals." Muir spent years telling the story, and close to thirty years before he was able to put it in writing. Though the story itself is a simple one, Muir felt it was the hardest thing he ever tried to write. Muir saw Stickeen as "the herald of a new gospel" adding "in all my wild walks, seldom have I had a more definite or useful message to bring back." Muir wanted to present that message in the best way possible. When first published in Century magazine in 1897 (V. 54, no. 5, Sept. 1897, under the title "An Adventure with a Dog and a Glacier), it was heavily edited, with whole sections of what his editor called "digressions" deleted. For the original manuscript, painstakingly re-constructed from the Muir Papers, see Ronald Limbaugh's book, John Muir's "Stickeen" and the Lessons of Nature . Muir was able to restore some of his thoughts when he published the story in book form in 1909. It was revised and re-told again in his 1915 Travels in Alaska , and has been re-printed several times since then in all kinds of formats, in the 70's, 80's and 90's. 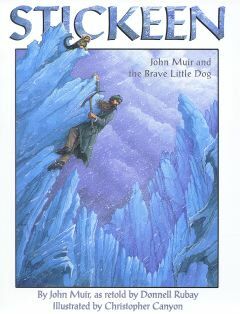 Muir's story has inspired several books with outstanding illustrations. The 1990 paperback edition published by Heyday Books, contains outstanding black-and-white illustrations by Carl Dennis Buell. The Donnell Rubay re-telling of 1998 (Dawn Publications) is accompanied by outstanding color illustrations by Christopher Canyon. Another childlren's picture book of the story was illustrated by Karl Swanson, and written by Elizabeth Koehler-Pentacoff (Millbrook Press). Be sure to read about these these editions below. See below for Muir's actual Stickeen writings, plus links to a variety of pages about books, audio, and music that tells more about Muir and his remarkable canine friend, Stickeen. 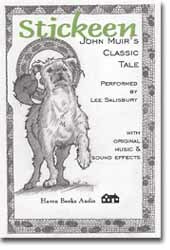 "Stickeen: The Story of a Dog" , by John Muir -- the 1909 book version, with annotations by Riverdale Press (Boston: Houghton Mifflin), edited with a few additions from the 1897 version. "Stickeen: An Adventure with a Dog and a Glacier" , by John Muir -- the 1915 (shorter) version, excerpted from Travels in Alaska. A French translation by Rose-Marie Vassallo, with illustrations by Francois Davot, was published copyright 1982 by publisher Castor Poche Flammarion, Paris. John Muir's "Stickeen" and the Lessons of Nature , by Ronald H. Limbaugh (Fairbanks, AK: University of Alaska Press, 1996) Black and White illustrations; Index. Appendix: "Notes on 'Stickeen' in John Muir's Library." 185 pp. 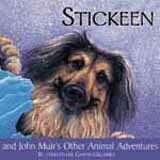 This scholarly examination of Muir's famous dog story "Stickeen" helps greatly to illuminate Muir's growth as a writer. Ron Limbaugh uses "Stickeen" to show how Muir's literary creativity grew over time, and how it was influenced by major turn-of-the-century ideas and events such as the Darwinian debates and the emerging animal rights movement. Moreover, Limbaugh notes that "Stickeen" is the only literary product from Muir's pen that can be directly and extensively linked to ideas formulated from the books of his personal library. Accordingly, "Studying its origin and evolution is essential to understanding Muir's development as a writer and as an advocate for the moral equality of all species." A book jacket summary of this book is available. 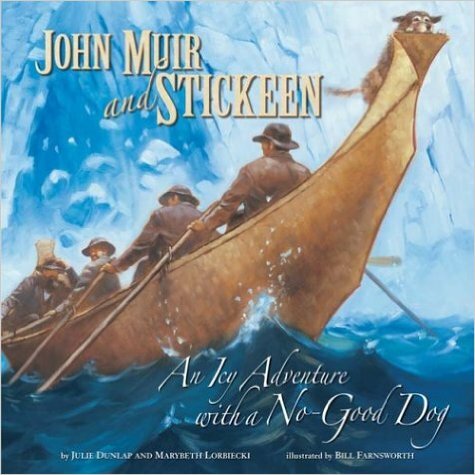 A beautifully-illustrated children's book based on Muir's own book Stickeen, which tells the thrilling adventure of how Muir set off to explore an Alaskan glacier one day, with the unwelcome accompaniment of Stickeen, and ran into a storm. What happened on that terrifying day made Muir see domestic animals in a new light. For ages 5-8, Grades 1-4. The School Library Journal opines: "Although not the first picture-book version of this story about a harrowing 1880 expedition to Glacier Bay, this excellent rendition is the best treatment so far." The Journal goes on to note: "The only flaw in the text is that the authors overplay the naturalist's disdain for dogs in general. While Muir's own Stickeen (Houghton, 1909) does confirm that he thought Sitckeen to be "small and worthless" and likely to "require care like a baby," he also states plainly that he did generally like dogs. Apart from this minor mischaracterization, they do a fine job of conveying the wonder that inspired the man's life work and the peril of this particular exploit. While some portions are condensed and others drawn out, they generally remain faithful to Muir's own accounts." This children's picture book contains beautiful art work by Christopher Canyon. Muir's story is re-told in simple language, while remaining true to Muir's words. Also see the Publisher's press release. 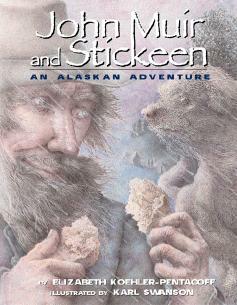 John Muir and Stickeen: an Alaskan Adventure , by Elizabeth Koehler-Pentacoff, Illustrated by Karl Swanson. This picture book is for younger children than Rubay's book (K-3). The author tells the story in the present tense. Full-color illustrations by Karl Swanson highlight the hostility of the environment and the incredible courage of Muir and his canine companion. 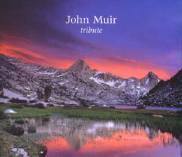 Gerald Pelrine Presents "The Tale of Stickeen"
Gerald Pelrine's riveting rendition is included on the John Muir Tribute CD. Gerald Pelrine offers his critically acclaimed characterization of Muir as lecturer reliving the experience and the lessons learned: the great crevasse of the glacier as symbol of "the valley of the shadow of death." little Stickeen perched atop its rim, the joy of deliverance, and his shattering view of eternity seen through the eyes of "the silent, philosophic Stickeen." "Stickeen," performed by Lee Stetson, CD, 1990. The icy storm story of a little dog named Stickeen is perhaps the most popular and most loved of John Muir's many wilderness adventures. Your heart will race with excitement and anticipation as you listen to renowned actor Lee Stetson describe the thrilling adventure of this "little, black, short-legged bunchy-bodied, toy dog" on the Alaskan glacier. You'll also hear Muir's other thrilling - and true - animal encounters, with bears, rattlesnakes, pigeons and many more, including dogs, cats and sheep. All are extracted from Muir's writing and woven by Stetson into a splendid performance. Always exciting, often humorous, these stories present Muir's "gospel" of preaching the fundamental unity and kinship of all the earth's life forms. The classic tale of man...and man's best friend, by the great naturalist. From the heart of Alaska comes a tale at once harrowing, and uplifting. Travel with the great adventurer John Muir as he takes his most memorable journey. Performed by Alaska NPR's leading voice actor Lee Salisbury, and featuring original music and sound effects, this is one of the most popular stories in Alaska, one of the most touching of animal stories, and a truly great adventure for the whole family. From the CD cover: Storyteller Garth Gilchrist becomes John Muir, recounting the most beloved of all his adventure stories: bears, flying mountain sheep, a lightning squirrel, wise and hilarious farm animals and wondrous birds. The concluding story, Stickeen [24:22 minutes], is a tale of a life-and-death glacier crossing with an extraordinary dog, through whom Muir finds a window into the hearts of "all my fellow mortals." 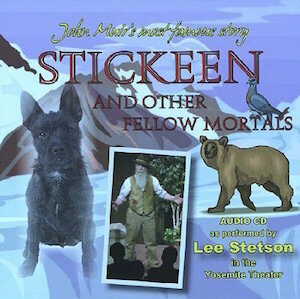 John Muir's story of Stickeen is also included in the various audio versions of his book, Travels in Alaska . Me and Stickeen - by Bill Oliver, a moving ballad sung as if from Muir's perspective. Review and lyrics available. "Alaska Stories". VIDEOCASSETTE. Written and narrated by W. Claud Thompson. (47 min. ); Color VHS. Order from W.C. Thompson & Co., 19229 Sonoma Highway, Suite 143, Sonoma, CA 95476. This video begins and ends as a travel documentary, but focuses on three historical stories of Alaska, including a fulfilling treatment of John Muir's "Stickeen." Stickeen and John Muir illustrations © Copyright 1990 by Carl Dennis Buell; used by permission.